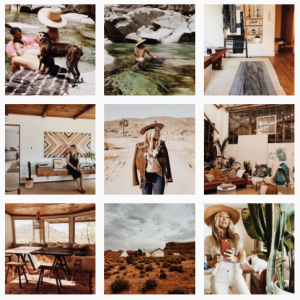 An Instagram theme is a trend hitting the social media network, whereby the aim is to get the collated images on their news feed to have visual consistency and coherence. This covers an umbrella of factors, from posting photos of the same or a similar subject to sticking to a colour scheme. 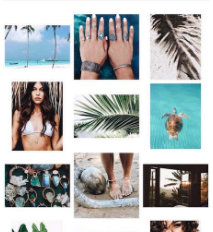 Instagram themes can be seen on many different types of user accounts; personal, celebrity and brands, to be used for many different purposes. This can be really useful for a brand’s account by creating consistency, cohesion and making the brand recognisable – all essential parts of building a brand. When a user views an account that has adopted a theme, they are more likely to remember and interact with it just because it looks more attractive when all of the posts are coherent. It can also just be a bit of fun for your personal account. 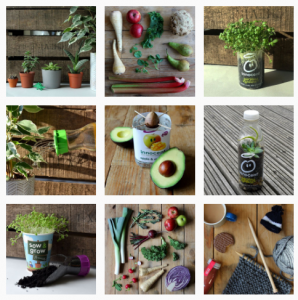 Plus, when you look at some of the examples on Instagram, it’s hard to resist creating your own theme! 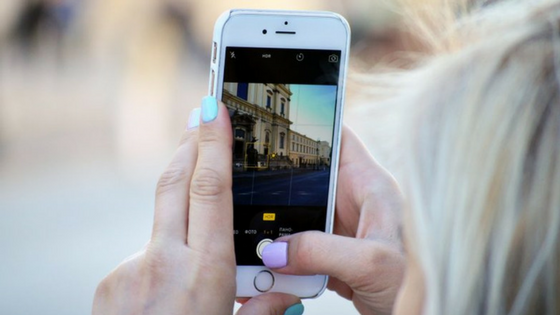 Creating that perfect Instagram theme can be time-consuming, and may take some trial and error before you get it right. You can practice on your own, or use external apps and software to help you out. 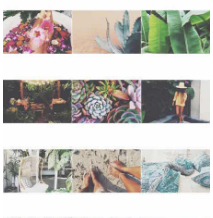 Think about what you want your Instagram theme to be about. It can be difficult to work out if a photo you have prepared to post will fit in with the rest of your theme that you have already so carefully curated. Sometimes, people will post the photo and review how it looks on their feed, and if they feel like it doesn’t look right it will quickly be deleted with the hope no one else saw the post or deleted a day later. Alternatively, apps have been built that allow you to provisionally plan, post and rearrange your feed to see what it could look like – before you actually post it. You can then log into Instagram and copy your ideas over from what you thought worked best when using a planner tool. If you really wanted to, software like ContentCal will allow you to auto-schedule your posts right down to the minute, which can be helpful for busy bloggers or social media managers. Here’s an example of a planner and auto-schedule from Later. Likewise, ContentCal is great to help you organise yourself with posts. Are you currently following anyone on Instagram who has a theme going on? Was this a contributing factor to why you followed them? Take notice of any accounts you like the look of and see if you can adopt similar techniques to what they are doing. 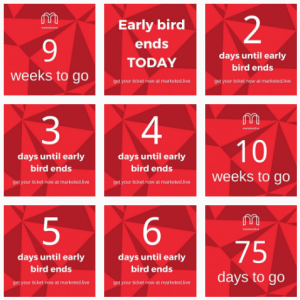 Choose an aesthetic – a particular subject, theme, colour, recurring images; anything! You can base your theme on any consistent factor – posting the same type of subject, a consistent composition, similar photo filters, colour coordination… the list goes on. A monotheme is a theme where the same subject is used, which could be interesting if you are very passionate about something or have a particular idea or product to show. You could consistently post about the same subject, or change each photo between two or three different subjects in a sequence. 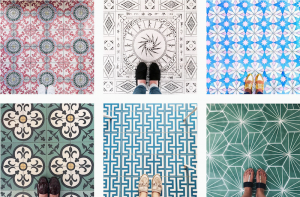 @ihavethisthingwithfloors only uses floors as her subject, which at first may seem quite a dull topic to post about, but uses a theme create a feed on a subject from a really different approach. Colour can be used in so many ways – you could adopt a black and white theme, you could insert the same tint of colour into every post or you could use different pops of colour. A colour splash tool can be used to make one part of a photo stand out in colour while the rest remains in black and white, which can be used in various different ways again, perhaps to highlight a particular product or colour. A colour pop theme can be used where a range of colours exist in your Instagram feed but fit together like a rainbow. This can be achieved using bright or pastel coloured images, and using high saturation. A business account may just use one consistent colour and look, and can be used to push promotions. This can catch the attention of a user by very clearly conveying the message you want to get out, as done in @marketed.live‘s post. It’s also easy to use the Instagram editor, or an external app, to change the exposure of images. Images can be edited to be underexposed to create a dark toned theme, or overexposed to create a light toned theme. Even simple things, such as using the same lighting in your photos – studio lighting, natural light, a certain tone of light or even capturing photos at dusk or dawn, can bring your feed together if used consistently. @aleksandrazee uses a consistent filter and a brown tone throughout her feed to create her theme. The composition of the subject can be a basis for a theme. For example, the idea of a flatlay theme is using a composition from above the subject. Alternatively, you could experiment with using unusual angles to shoot an image, such as showing architecture in a different way for example. Sometimes you will see feeds that post a subject in a sequence of three. This may be one photo split up into three parts, or three very similar posts. 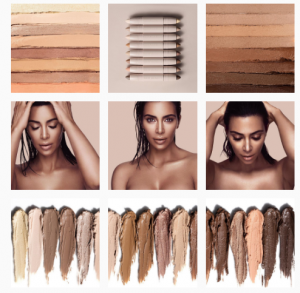 This can be seen in Kim K’s promo for the launch of her makeup brand. You could even post one whole image over the space of six, nine or however many posts to spell out a message or to convey a huge picture. This can be quite helpful for a business account. There is even a range of borders you can use for your photos to make the feed look visually appealing. You could use Instagram’s basic square option, but there are more options available. Using apps like Instasize allows you to add borders to your photo horizontally or vertically. The basic setting for this border is white, but you could change this to any other colour. You can also use a patterned border, or insert an image as your border. As well as the type of border you use, you can also experiment with the size of the border. You can stick to having no border, therefore all images are the same square size and when looking at them in the feed they all fit together with no spaces in-between them. However, if you do choose to use borders for your photos you can choose different sizes. You can decide if you want square, horizontal or vertical photos borders, or a mixture of all. Whether you’ve used a tool or have posted yourself, review how your feed looks after posting or from time to time. Some photos, videos or Boomerangs (see our last blog post for what a Boomerang is here) may just not fit in with your feed. It depends on what the purpose of your Instagram account is, and how seriously you implement the theme, but if you so desperately love a post but it just doesn’t fit in you don’t have to delete it, it’s your Instagram account after all. For a brand, just one inconsistent post may have a more serious effect on your follow account and engagement so just take the brand’s reputation and visual image into consideration. 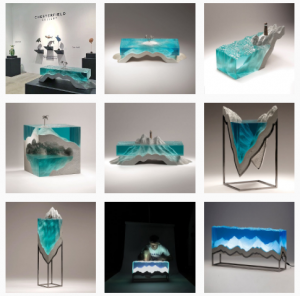 There’s so much variation in everyone’s Instagram feed because there are so many ideas you can experiment with. There are plenty of tools available to help you and plenty of inspiring feeds to gather your ideas from. Most of all, just do what you feel looks best for your business or your personal account, and have fun with it!